India has a wonderful capability as a country to suprise its visitors by suddenly revealing something totally unexpected. For me, Kodaikanal (or Kodai as it is sometimes referred to) was the setting for such an experience. Waking up early on my first morning in Kodai I looked out of the window to see the valley beneath me was filled with a blanket of fluffy, sunlit clouds. This would not have seemed suprising to me, perhaps, had I been in the Himalayas where I might expect a view like that, but I was in south India. I was staying in the mountains that just a couple of weeks ago, on the beach in Kerala, I had not even known existed. 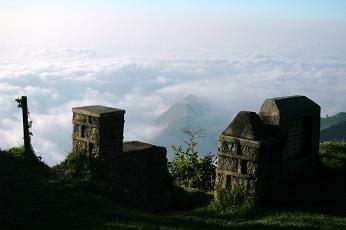 Kodaikanal is in the Dindigul district of Tamil Nadu, and sits at 2,133 m above sea level. Peak seasons see growing numbers of tourists visiting Kodai, though foreign tourists still visit in fairly low numbers. Visitors enjoy Kodai's spectacular mountain views, its forested vegetation of Eucalyptus and pine trees, its waterfalls, cool temperatures and many trekking possibilities. Coaker's Walk Lying to the south east of Seven Roads Junction (central roundabout) by the CSI church, Coaker's Walk is a short pathway offering beautiful views of the valleys which in the morning are often covered in mist or clouds. Small entrance fee applies. Trekking in the Mountains Hotel staff, tourist offices and random others will all want to organise treks for you, guides may charge around R.80 - R.100 per hour and will suggest a few routes you can choose from. The tourism office in Kodaikanal (Anna Salai/Bazaar Road, tel. 241675) issue trekking route leaflets if you want to explore alone, though the maps are a bit vague! 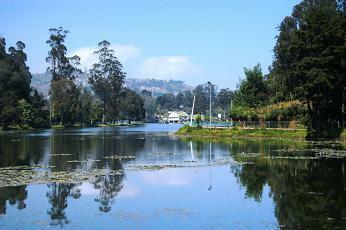 Circuit the Lake Walking or cycling around Kodaikanal's man-made lake is a pleasant, 5 km route. Very pretty in the morning when kingfishers can often be seen. Get cosy by the fire If you are lucky enough you will find a room with a log fire to evade the cold nights and get cosy in your room. Shops in town sell pots, pans and food, so you could even heat dinner on the fire - or tea at the very least. Watch the stars Being so high in the hills above the haze of the plains below and away from major light pollution, the stars in Kodai can be magical. The nearest major Indian town to Kodai is Madurai, which is 120 kms away. The Madurai Airport [IXM] runs domestic flights from Mumbai, Chennai and Bangalore. The city is well connected by train to other major towns. Kodai Road train station is the closest rail connection to Kodaikanal, 80 kms from the town at the bottom of the mountain. From here travellers can catch onwards taxis (R.1000+) or buses (R.15) for the steep ascent. A booking office in Kodaikanal on the Anna Salai Road can help with return journeys. Kodaikanal is connected by coach/bus to many other Indian towns and cities and tourist destinations. Leaving Kodai, book tickets in advance from travel agents by the bus stand on Woodville Rd (off Anna Salai Rd) to destinations including Palani (2hrs), Madurai (3.hrs), Coimbatore (5hrs), Kochi (8hrs), Ooty (8hrs) and Chennai (11hrs). In town there are oddly no rickshaws, though the town centre is very small and can easily be explored on foot. Taxis to viewpoints are on the pricey side. Bicycles can be hired cheaply from stands by the lake, but roads are steep! Seven Roads Junction by the Kodaikanal International School is a good point of navigation. From here, Anna Salai/Bazaar Road runs north-east. On this road is the Tourist Office (for maps/trekking) as well as shops, ATMs, buses and internet cafes. To the south-east of Seven Roads Junction is the CSI Church, Coaker's Walk, Byrant Park, the hospital and Greenlnds Youth Hostel (see below). Kodaikanal Lake is to the west of town. Located in Kodaikanal India has an inernational Christian boarding school (www.kis.in/place/introduction.html) which gives a lively, multi-cultural feel to the town by bringing in students from all over the world. Greenlands Youth Hostel is perhaps the best located guesthouses in Kodai, looking out over the same valley as that of Coaker's Walk. There is a friendly atmosphere among guests and the rooms all have stunning views, some even have fireplaces! Count payments in front of staff when leaving - we were told after our payment had been accepted that we were R.100 short. Dormitories are inexpensive, and there are some (cold) cottages at the bottom of the site which are about R.500 a night. The rooms in these are very basic, but the views are the best. In the main building some rooms at ground level go for around R.700 a night and are large and clean. The rooms on the top floor are generally R.900+ and have 24 hour hot water. Try Strawberry Park (tel. 242340) opposite the post office on Anna Salai Road for further reasonably priced options, or if you can splash out, have a look at the Villa Retreat (www.villaretreat.com) for cottages with great views and the Carlton Hotel (http://www.krahejahospitality.com/carlton/homepage.htm) for luxury stays. Note that accommodation prices can increase dramatically during the peak season of April to June. Out of season, prices are usually negotiable for longer stays. Hill Top Inn on the way into town from Greenlands Youth Hostel serves great Indian food, as does the Hotel New Punjab on PT Road off Seven Roads Jctn. There are plenty of eating options along this bustling street. Eco-Nut on PT Road sells excellent organic produce and fresh breads and cheese(!) for picnics, though was a little bare when we were there out of season - their muffins were great though. Shops along PT Rd and Anna Salai Rd sell homemade chocolates, tea, biscuits etc. Summer: (peak season) April to June, 11'C - 20'C. Monsoon: July to Sept., frequent rain. Winter: Oct. to Jan., 8'C - 17'C (dropping to 0'C at night). The tourist seasons are April - June and September - October. In Kodaikanal India monsoonal rain restricts activity. We came in February and found the days warm, the nights cold and the streets quiet. In Kodaikanal India? 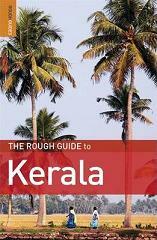 Read about destinations of neighbouring state of Kerala in our travel to Kerala guide.